Home » Frequently Asked Questions » Should I File for SSDI While my Comp Claim is Pending? Should I File for SSDI While my Comp Claim is Pending? Will Filing for Social Security Disability Create Problems in my Workers’ Compensation Case? As you may know, Social Security offers a disability program that provides benefits and Medicare or Medicaid to disabled persons. Unlike Social Security retirement, Social Security disability is not dependent on your age – you can collect if you meet Social Security’s definition of disability. If you are found eligible for SSDI (the disability program based on your earnings record), you become eligible for Medicare 24 months after the date of your first SSDI payment. If you are found eligible for SSI (the disability program for low income applicants), you become eligible for Medicaid immediately. If you have been seriously injured at work, you may very well meet Social Security’s definition of disability. Recognize, however that the definitions of “disability” used by Social Security is not the same as “disability” for Georgia workers’ compensation purposes. For example, in the Social Security disability system, there is no “partial” disability. 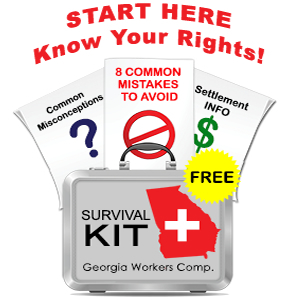 Georgia workers’ compensation law, however, does recognize both total and partial disabilities – you can get workers compensation benefits while on a light duty restriction. What is a Medicare Set Aside (MSA) and How Does it Affect Me? Medicare – the federal government health care benefit program – is running out of money. They want to force injured workers and workers compensation insurance companies to pay for medical care associated with work injuries instead of putting that financial obligation on Medicare. When you settle your workers’ compensation case, the insurance company’s responsibility usually comes to an end. Under the Medicare set-aside rules, part of your settlement must be “set aside” to cover anticipated future medical costs. In other words, when you settle, some of the settlement money that would otherwise go to you instead goes to a separate account that will be used to pay for future medical costs. Medicare does not want you to “shift” responsibility for future medicare for medical care arising from your work injury. Medicare Set Asides in Georiga workers’ compensation cases are calculated on a case by case basis. If you file for Social Security disability before your workers’ compensation case settles, you are basically telling Medicare that you expect to be a Medicare recipient in the future. Medicare will then demand a larger set aside from your workers’ compensation settlement – and you will get less cash in pocket. If you wait until after your workers’ compensation case settles before applying for Social Security disability, then more of your workers’ comp. settlement may end up in your pocket. However, you may have to wait 30 months before applying for Social Security disability once you settle the workers’ compensation case if the only reason you are filing is due to the work injury and not another non-work related medical condition. On the other hand, you can lose your eligibility for Social Security disability if you wait too long after you stop working to file. In addition, Social Security benefits will be offset by workers’ compensation, meaning that it may be difficult to find a lawyer to assist you with Social Security under a straight contingency fee contract. As you can see, the question of if and when to file for Social Security disability can be very confusing. I advise my clients to come to me before filing for Social Security so I can advise them of their options.